Take back your backyard with this inexpensive DIY tiki torch fuel for mosquitoes made with essential oils. Summer is winding down, but no one has told the mosquitoes. They are still in full force. It doesn't help that we have ponds and are surrounded by cornfields on three sides of the property. They don't exactly spray for mosquitoes in this area. Lately, I've been making our own mosquito and bug repellents with essential oils for a natural option. I've been very please with the results. The guests that we have over definitely appreciate that I'm using natural ways to repel bugs too. I make my own bug repellent spray with essential oils, and I even made bug repellent tarts to use on the patio. Our farm is a long narrow rectangle with the house in the middle. But in the back corner, for some reason, there's a square attached to the side of the rectangle. Years ago, someone planted trees around it, so it's really hidden from view. It makes the perfect spot for outdoor parties and backyard camping. We usually have tiki torches to light the way and help control the mosquitoes since it's too big of an area for candles or my bug repellent tarts. I have several tabletop torches that I sit around on tables for light and to help repel bugs. I was buying a lot of citronella fuel for them, but then I thought why not make my own? I was a little surprised that tiki torch fuel was so easy to make. In fact, this uses just two ingredients! The base of the recipe is vegetable oil. Yes, the same oil that you buy for cooking. I was at Aldi, so I grabbed their canola oil to make my torch fuel. I don't see why you could't use any vegetable oil except coconut oil, but the canola was the least expensive. I wanted to use a blend of essential oils to naturally repel mosquitoes and bugs. I had bought some oils to make my own, but before I could make it, Crafty Bubbles had already made one. It comes preblended with essential oils that are proven to repel bugs. The highest concentration in the blend is lemon eucalyptus, which is a proven insect repellent. In fact, if you look at natural brands of bug repellent, most are just lemon eucalyptus. As I mentioned, lemon eucalyptus naturally repels mosquitoes, so you can use that alone in this DIY tiki torch fuel. It's also said to naturally repel ticks, although I'm not sure I'd rely on it to completely protect me or my kids. Peppermint is another great natural insect repellent. It works great on spiders and even rodents, but it can also help with flying insects. Lavender is relaxing, and it also repels bugs. It's supposed to be best for moths, which we have a lot of here. Pine isn't my favorite smelling oil, but it does help repel bugs. If you do use it, I would mix it with another oil because it's so overpowering. Unless you really like pine. Vetiver can naturally repel flying bugs, including mosquitoes. Fun fact: vetiver is also calming. I'm so tempted to use this in large crowds just so people calm down and pay attention. 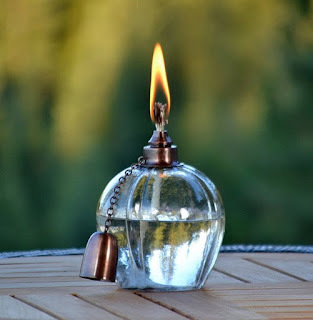 Citronella is probably the most popular bug repellent essential oil. It does work, but I think that lemon eucalyptus works better. I used a mason jar to mix my DIY tiki torch fuel. I added 2 cups of oil to it and 4 teaspoons of essential oils. If you live in town or where they spray for mosquitoes, you might be able to use 1 teaspoon per cup of oil. Put a plastic cap on the mason jar and give it a good shake. Fill your tiki torch to the fill line with your DIY tiki torch fuel. Light your tiki torch and take back your backyard. This should last for hours. Just refill as needed. I keep a few cups on hand so I don't have to make it all the time. Always use caution with tiki torches. They do have a live flame, so don't use them where children or pets could bump into them. Don't forget to label your DIY tiki torch fuel for mosquitoes. I was horrible about labels until I just bought a pack of labels from Amazon. I could die cut them myself, but I never seemed to get around to it. Now I have labels right there waiting to label my stuff. I picked up my tabletop tiki torches at Aldi for $2 each! They are so cute too! I was going to make my own, but I couldn't buy the wick for that price. 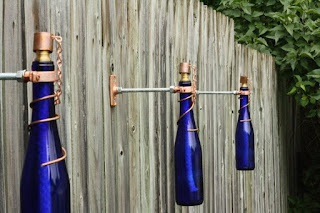 If you want to make your own from wine bottles, you can get a kit with everything that you need but the bottle. I was going to go with a mason jar style tiki torch because farm life and all. 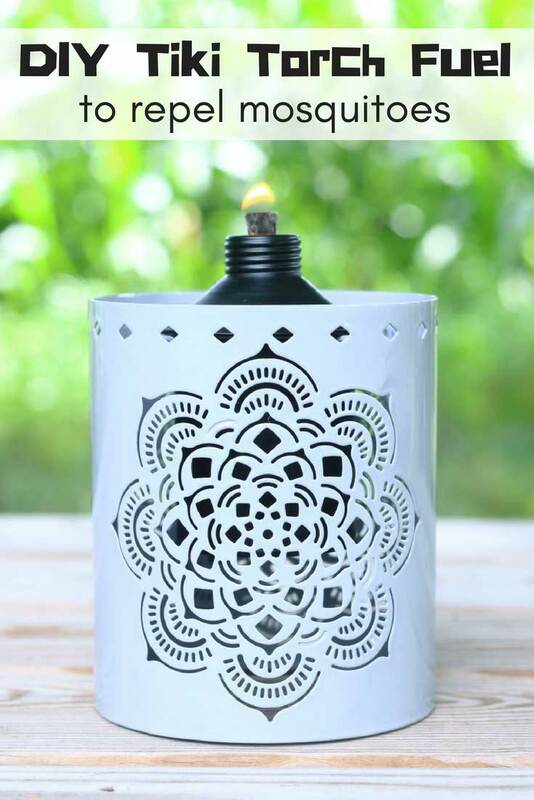 For those who aren't into DIY but still want a unique tiki torch, try Etsy. Here are some really cute ones I found that I like. Sign up for my newsletter to get updates for new posts. Choose the lists you want to be on, or get all posts daily or weekly.